Currency is of two kinds: Money and Funds. Money is obtained from a few quests – good luck figuring out which ones since the quest details don’t clearly tell you which type of Currency you get. They are very sloppy about this documentation, even in the game. Also Money is what you get from selling loot items that you pickup while farming or questing. Money can be exchanged with other characters. Funds are obtained only from quests and “Roll Call” and cannot be traded with other players. Apparently Funds were invented when folks noted a problem with the “Roll Call” system that gives you EXP, and Money just for showing up. You check in each day and collect the rewards. Well, folks created some characters that did no thing but show up for roll call and then passed the money to their main character. So Funds were invented to prevent this kind of exploit. So, some things can be bought with Funds first, and then Money, and some with Money only [ like tickets to campaigns], and who knows what else, since it’s not documented and impossible to tell often in the games. Just to make it totally confusing, rewards from quests are usually Funds, but not always. A quest for the Red Moists for example gives 2 Gold, and this turns out to be Money, not Funds. But it doesn’t say so. And since there is no complete wiki, you can’t look up which quests give you money, and which funds, so if you are short on Money to get your Mounted Combat skill upgrades, there is no way to find out which quests you should do. This is the point at which I decided to take a break from Ho3K and come back when they fix the Funds / Money thing or fill out their Wiki. I don’t need this frustration in a game, that is otherwise a lot of fun to play. The ticket can only be purchased for Money not Funds. Note two currency lines on Bag to the right of picture. It doesn’t say that in the NPC window. Some NPC windows say that Funds are consumed First. In this case, only Money would do. 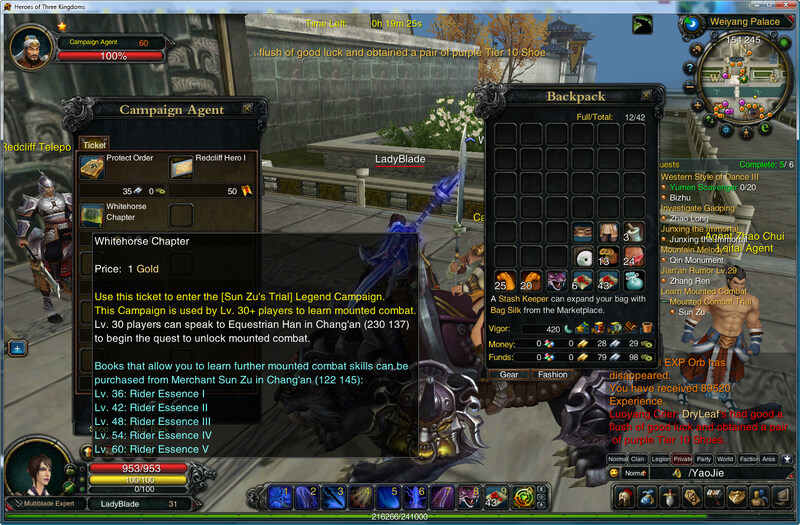 So why is it immoral to purchase a ticket to the campaign with Funds, which you earned by doing quests? Is there some feeling that quest currency is not good enough to purchase campaign tickets? The Mounted Combat system is totally punitive and difficult due to the funds problem. The Guard system, which was added later and which gives you a Human Pet to fight along side you, is totally well documented and does not require any funds or money to participate in. I wonder why the choice to penalize players for Mounted Combat and then make Guards easy to get? Oh well. Taking a Break like I said.